It’s been available for some time from Wincustomize but I never did any big announcement. 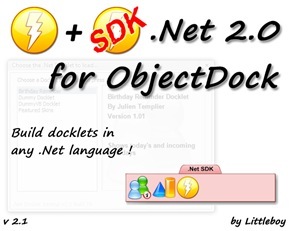 The old .Net docklet for ObjectDock was compiled with .Net 1.0 and thus wasn’t working on newer version of the Framework. It also had problems on Vista with plugin registration which didn’t work with UAC on. The new version is compiled with .Net 2.0 and should run correctly on Vista. I recently published a small update with support for ContextMenuStrip for docklet context menus, a check for older versions of the SDK so that docklets can specify a minimum supported SDK version and a workaround for the broken OnDropFiles in ObjectDock. There is also two new Host methods exposed (DoClickAnimation and RemoveSelf). The .Net 2.0 runtime docklet is available from Wincustomize and you can download it here.